This article is about the film. For the online dating website, see ChristianMingle. 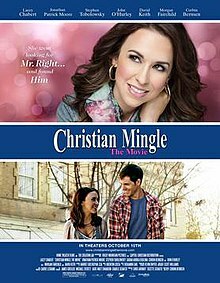 Christian Mingle (sometimes promoted as Christian Mingle The Movie) is a 2014 faith-based romantic comedy film written and directed by Corbin Bernsen and starring Lacey Chabert as a woman who uses the online dating website Christian Mingle to meet a man. The film was released in the United States on October 10, 2014 to VOD. After a couple of successful dates, Paul takes Gwyneth to a Bible study group at his friend's house. She meets Jessy (Sascha Alexander) and Jimmy (Tony D. Czech), a couple who also met through the site, Gabby (Jessa French) and Tommy (Justin Dray), who are expecting their first child, and Kelly (Jill Saunders), a childhood friend of Paul's. Paul asks Gwyneth to go to church and meet his parents, Lacie (Morgan Fairchild) and Bill (David Keith). After Gwyneth meets with Jessy, Jimmy, Gabby, Tommy and Kelly, Paul reveals that he will be travelling to Mexico with his father's construction company to repair a church in Mexico. Gwyneth is annoyed that she wasn't told but is persuaded to join everyone in Mexico. She takes time off from her job but while there her copy of Christianity for Dummies is discovered and she confesses to Paul that she wasn't a practicing Christian when she signed up to the site. They break up and she returns to America. When Paul and his family returns Gwyneth goes to see him and learns that he is with Kelly. Her boss Douglas McCarver (Stephen Tobolowsky) has Gwyneth write a campaign to sell a cure for baldness for their client Donny Da Bona (John O'Hurley), but she cannot lie due to her newly discovered faith and quits to go become a teacher at the village in Mexico. Some months later Paul returns to the village to tell Gwyneth that he has broken up with Kelly, and he and Gwyneth happily reunite. Gwyneth then, hand in hand with Paul, introduces him to her students. Paul proposes to Gwyneth during the end credits. ^ Chase, Serena (October 10, 2014). "Interview: Corbin Bernsen of Christian Mingle: The Movie". USA Today. Retrieved December 25, 2018. ^ Mora, Celeste (August 11, 2014). "Lacey Chabert's Christian Mingle Isn't the Mean Girls Star's First Declaration of Faith". Bustle. Retrieved December 25, 2018. ^ Shulgasser-Parker, Barbara. "Christian Mingle Movie Review". Common Sense Media. Retrieved December 25, 2018. ^ Lusk, Darian (June 9, 2017). "Weekend Stream: Christian Mingle Unintentionally Funnier than Most Rom-Coms". Observer. Retrieved December 25, 2018. ^ Oller, Jacob (June 7, 2016). "Review: Corbin Bernsen's Christian Mingle (Netflix)". Vague Visages. Retrieved December 25, 2018. This article about a 2010s romantic comedy film is a stub. You can help Wikipedia by expanding it. This page was last edited on 21 March 2019, at 06:02 (UTC).